If all religious organizations are approved by God, it would seem that the more of them with which one might identify, the better off he would be. If, on the other hand, the Lord honors only one redemptive organism — the church which he planned, and for which his Son died (Acts 20:28) — then it would follow that affiliation with any humanly-devised religion system would be at variance with the will of God. Occasionally we are asked about the nature of Freemasonry (the Masonic Lodge). Is this institution merely an innocent fraternal organization that a Christian man might join with impunity? Or does it partake of a religious nature? There are those — even some Christians — who argue that there is nothing intrinsically wrong with the Masonic Lodge. “I am not disposed to yield, on the subject of the religious character of Masonry, quite so much as has been yielded by more timid brethren. On the contrary, I contend, without any sort of hesitation, that Masonry is, in every sense of the word, except one, and that its least philosophical, an eminently religious institution — that it is indebted solely to the religious element which it contains for its origin and for its continued existence, and that without this religious element it would scarcely be worthy of cultivation by the wise and good” (1874, p. 640). “Few Masons, if any, regardless of rank or station, ever learned very much of its profound philosophy, its religious meaning or faith, or its scientific and spiritual truths” (Light From the Sanctuary of the Royal Arch, p. ix). Mr. Snodgrass further affirmed that Masonry is “a fraternity teaching spiritual faith by allegory and moral science by symbols” (p. xvi). “Its purpose is to inculcate due reverence for Almighty God and true Brotherhood among men” (p. 162). These quotations speak eloquently. Another authority is even more explicit. “We are, therefore, inevitably driven to the conclusion that Masonry is not of human, but of divine origin ... Now, my brethren, let us realize that God is the author of our great and glorious institution, that its divine truths were revealed by Him to the earliest representatives of our race — that these God-given principles have been espoused and practiced in every age of the world, and that Masonry is infinite, eternal and spiritual, and that to be Masons in deed and in truth the spirit of Masonry must dwell within us, and dominate our lives” (Taylor-Hamilton Monitor of Symbolic Masonry, pp 14, 20). An issue of The New Age magazine, the official journal of Scottish Rite Masons, asserts that Masons “are taught to erect a Temple more durable than granite or marble — a Temple composed of living stones, a spiritual building, a house not made with hands, Eternal in the Heavens” (April, 1953, p. 228). A comparison of this quotation with 2 Corinthians 5:1 and 1 Peter 2:5 will reveal that the Masonic writer lifted his descriptions from the Bible. Quotations such as these could be multiplied many times over. These are surely sufficient, however, to plainly establish that the leading scholars of the Masonic faith consider their system to be a religion, and no informed person can deny it. 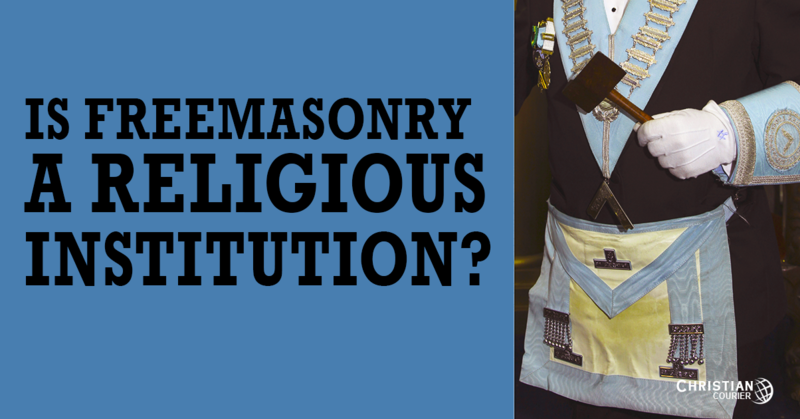 Even without the foregoing confessions from Masonic authorities, a consideration of the multiple symbols that are a part of the fabric of Masonry would reveal the system’s religious essence. The head of a local lodge is denominated the “Worshipful Master” (contrast with Matthew 23:8-10), and, among other officers, there is the Senior Deacon and Junior Deacon. Among “Christian” Masons, the Worshipful Master is a symbol of the Redeemer, Jesus Christ (Snodgrass, p. 47). There are 33 degrees in Masonry, beginning with the Entered Apprentice and culminating with the Sovereign Grand Inspector General. The first three degrees are known as Blue Lodge Masonry. These three degrees are very important, for as Snodgrass expresses it, this is “where we first saw the light” (p. 40). Can you imagine a man, who has been a Christian for twenty years, joining the Masonic Lodge and confessing that here he “first saw the light”? How would such a confession reflect upon Colossians 1:13? When the Mason attains the degree of Entered Apprentice, he is said to have passed from darkness into light. Upon receiving the second degree, it is affirmed that he has come from ignorance into knowledge (Tennessee Craftsman, p. 38). Again we ask, how could a child of God participate in such a mockery of Scripture? The third degree of Masonry, known as the Master Mason, is based upon the alleged murder of Hiram Abiff, a citizen of ancient Phoenicia, who was a contemporary of king Solomon of Israel. According to the Old Testament, the king of Tyre sent Hiram to assist Solomon in building the temple. Masonic tradition alleges that Solomon, the king of Tyre, and Hiram entered into a solemn agreement never to reveal the mysterious Master’s secret “word” (a password), until the temple was completed. Supposedly, this word was the true name of God! But the Masonic story contradicts genuine Bible history. In the Old Testament, the record is clear that Hiram finished the work he was assigned to do on the temple (see 1 Kings 7:40; 2 Chron. 4:11). He was not killed earlier — as Masonic legend has the story. The Masonic lodge room usually is located on an upper floor since high places are holy and peculiarly appropriate for religious purposes (Tennessee Craftsman_, p. 19). The lodge room is supposed to represent the universe while the covering of the lodge is symbolic of heaven, “where all good Masons hope at last to arrive” (_Tennessee Craftsman, p. 21) — including Jewish Masons, Moslem Masons, etc. How could a Christian ever endorse such error?